Fillings are one of the most common treatments performed by dentists. They are used to treat cavities in the teeth caused by decay and will also be used to restore broken or cracked teeth. Teeth that have become worn over time or have been damaged by constant grinding can also be restored by the use of fillings. Fillings have been performed in dentistry for over a century and the materials and procedures that are now used can leave your teeth looking natural and healthy; the latest material used in fillings can be indistinguishable from your own teeth. Tooth decay will cause holes in the tooth enamel; if this decay is left untreated it will progress further into the tooth, progress into the dental pulp and will cause abscesses. Once the dentist has found a cavity in your teeth, he will need to remove any underlying decay and then fill the cavity. You may have already had a filling in the past that has become cracked or worn down and this will need to be restored. Often people are unaware that their fillings are damaged, but pressure when chewing food can wear down or crack a filling; this will allow bacteria to enter the tooth and cause decay. Dental fillings only a have a certain lifespan, some can last for up to 15 years depending on the material used, and replacing or restoring fillings is a necessity to avoid tooth decay. 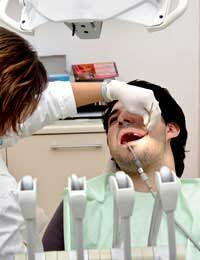 Once the dentist has ascertained that you are a candidate for a filling there are a few options available to you. The most common filling will be a direct filling using a dental amalgam. The filling procedure will usually be performed after a local anaesthetic that will numb the area to be treated. If you are particularly nervous or have a fear of injections you should ask your dentist if they offer some form of sedation dentistry as an alternative to the needle. The dentist will then use an instrument of his choice; this can be either a drill, laser or air abrasion tool that will be used to remove the decayed region of the tooth. After removing the decay, the dentist will then clear the cavity of any bacteria before applying the chosen filling. The final step is to clean and polish the filling. Depending on the depth of the decay and the type of filling used, there may be more steps to the filling procedure. If the decay is close to the root then a special liner may be placed there to protect the nerve. Extra finishing work may be needed if you have chosen a tooth coloured filling, in which case layers of filling will be applied and a light will be used to harden each layer after application. The dentist will then have to shape the filling to the tooth and trim any excess followed by a final polish. There are various types of materials available to you if you need a filling, each with their own advantages and disadvantages. Your dentist will help you decide which filling is right for you. The filling materials can range from gold to translucent ionomers. The two most popular fillings are amalgam and composite fillings. Once the most common filling, amalgam is rapidly taking second place to the more aesthetically pleasing white filling. Amalgam is made of various types of material such as silver, copper, mercury and tin and is extremely durable and hard wearing. Compared to other dental fillings, amalgam is inexpensive and so retains its popularity among dentists. Disadvantages are that amalgam fillings will not look natural and can be seen if placed near the front teeth. More drilling work may also be needed to the teeth in order to use this type of filling. Composite fillings are becoming more popular with people who want natural looking teeth, white teeth. Made from a mixture of glass and quartz in resin, the composite filling requires less work in restructuring the teeth and can be bonded to the teeth, meaning less intrusive dental work. Composite fillings are also hard wearing, although not as strong as amalgam fillings, but they will look natural and compliment the adjoining teeth. The downside may be that this type of filling can cost up to twice the price of an amalgam and it will take longer to perform the treatment. As with any dental work, cosmetic or otherwise, a good daily dental routine is required in order to look after your fillings; brush twice a day with a fluoride toothpaste and floss daily. Your tooth may feel sensitive to hot or cold for a few days after the filling, but this is quite normal. If the sensitivity does not subside within around three weeks then a dental appointment should be scheduled. Sensitivity or pain in newly filled teeth may be alleviated by using special desensitising toothpaste but if the pain is not alleviated then it may be a symptom of something more serious, and further filling work or a root canal may be required.